The Fyre Festival came on the scene promising to become an important cultural moment. They certainly achieved that – not for delivering on what they promised but rather because of the recent release of two documentaries about the fraud surrounding it, Fyre on Netflix and Fyre Fraud on Hulu. Those two films made the story so mainstream that interest in it has surpassed the real (fake) festival that actually launched. There is plenty written about what went wrong and the many red flags that seem so obvious in hindsight. Apart from the fraud, deception, immoral behaviour and refusal of accountability, there are also a few interesting takeaways of how they got people to believe in something. In a study titled Social Media and the Fear of Missing Out published in the Journal of Business & Economics Research, researchers attempted to validate a FOMO scale based on people’s views of themselves, their interactions with their peers and anxiety caused by social media. The concept of the festival, and not being there, would almost certainly fall pretty high on the FOMO scale. By creating the appearance that many people within their social media networks were talking about the festival, they stirred up the emotions in people that they too needed to be part of it. Tickets were expensive. Day passes were $500-$1500 and VIP experiences went for $12,000 up to $100,000, so they were targeting a pretty specific audience who could afford those prices. But the premium price of the tickets wasn’t solely about the acts or the promised experiences. What came with tickets was more than access, it was the social currency that the various photo opportunities would provide. If cell phones were banned, like when you see a stand-up comedian and have to put your phone into a pouch, would people still have been as interested in going? Probably not. Getting users to share your content is not easy to do on its own. Add in any kind of complexity and you’ve probably turned your chances from slim to none. So, what’s your best bet? Provide them something of value in exchange and make it as easy as possible for them. Tying to a treasure hunt for $1million in prizes they claimed to be part of the festival, Fyre asked users to post what is their now infamous orange tile on Instagram in exchange for a clue. They made it easy for their users. Post this specific thing at this time and get a clue. Research has shown that music festivals have positive psychological effects on people. Festivals become places for people to feel like they belong to a larger group. It gives them a sense of belonging and a sense of escape at the same time. For that short period at the festival, people would become part of a tribe. Fyre’s website promised attendees they’d “let loose and unplug with the like-minded”. Those like-minded they claimed were “the brightest minds in music, cuisine, art and hospitality…innovators and thinkers”. None of it turned out to be true of course. But there are festivals out there who create this sense of belonging before you even get there such as Wanderlust who creates a true community around their brand. There are many ‘influencers’ that don’t really have much influence, ultimately resulting in lots of brand dollars being wasted. But a strategically curated set of influencers with proven engagement can move the needle. Fyre basically got the Instagram influencer equivalent of the infamous Peter Lindbergh supermodel photograph for British Vogue magazine. The influencers they used had the credible authority of helping drive trends, and they leveraged that collective power to increase the resonance of their message with a well-coordinated social media takeover. 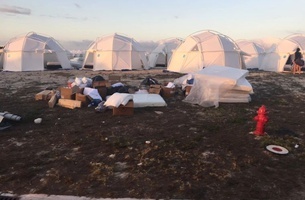 The Fyre Festival was a big con. As psychologist Maria Konnikova said in ‘Fyre Fraud’ about con artists, “they look into your soul, they see what you’re missing, and they take advantage of that”. As marketers whose job it is to communicate and convince, we’re often trying to understand people’s motivations and what will drive them to take certain actions. There are many tools to do so – studies on human behaviour, user data, research, colour psychology, neuromarketing techniques – and budgets to promote what we’re trying to communicate. With that comes the power to move people towards certain actions and inherent in that is a great responsibility. And we can learn a lot about doing right from something that was done so wrong.